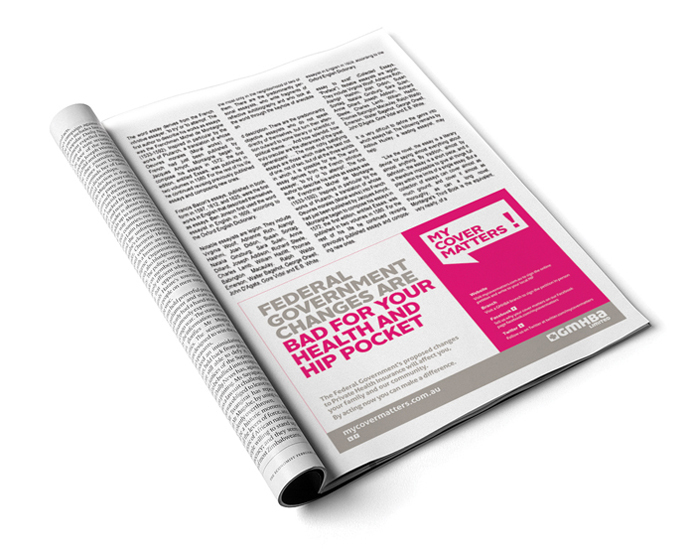 Truly Deeply helps GMHBA to educate and rally support from members and the community to oppose the federal government’s cuts to the private health insurance rebate. 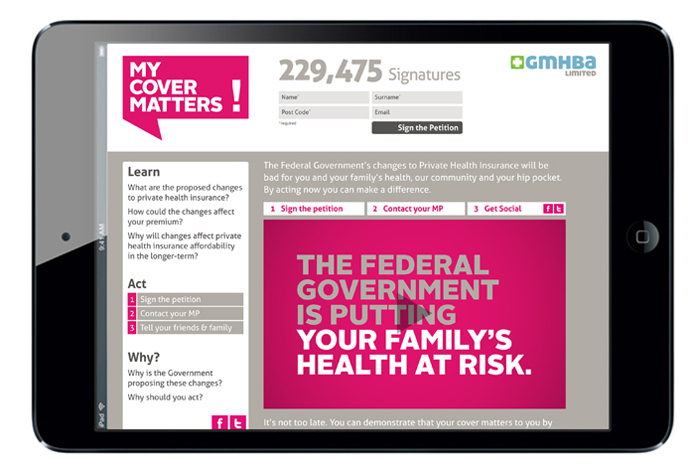 My Cover Matters is a branded campaign to educate, engage and motivate members as well as the broader community to take action to stop the changes. The Federal Labor Government has been progressively trying to reduce the private health insurance rebate as part of their austerity cost savings initiatives. Last year, the Government introduced means testing to the rebate, which has made health insurance more expensive for many Australians. They are now proposing further changes that will negatively impact low-income earners, making private health insurance less affordable and adding more pressure to the public health system. Like many health insurers, GMHBA is concerned that the government is not explaining these changes to the public. As a result, Australians won’t realise the true impact these changes will have on their hip pocket, their health and their community until it is too late. GMHBA Limited does not endorse any political party. 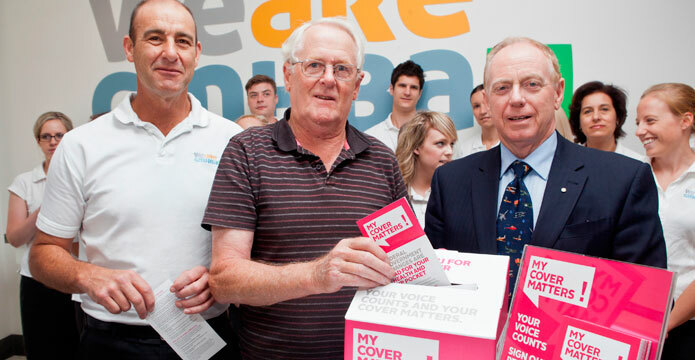 The campaign needed to focus on policy, its negative impact on GMHBA’s members, their community and the long term viability of the private health sector. It is about educating and representing member’s interests while also empowering them to have their say. The changes being proposed are extremely complicated and in many ways this has helped them largely fall under the radar for most people. Research highlighted a lack of awareness and general empathy towards the changes. Most people didn’t understand the changes, didn’t think it would affect them and hence were not taking any interest in the issue. We needed to make this an important issue and get people to take notice and act. This involved simplifying complexity and ensuring the message is relevant. We also needed to explain the importance of private health insurance in our community and re-frame it from ‘a luxury for the rich’ to an ‘essential’ part of our health care system. Working in partnership with GMHBA’s internal marketing team and their PR firm Redstick, the decision was made to create a new standalone campaign brand identity, ‘My Cover Matters”. “By creating a campaign brand, we could ensure a strong and single-minded message that could not only talk to GMHBA members but also become a voice for the broader community. A separate brand also ensured that it did not detract or confuse GMHBA’s on-going product and brand marketing,” says Michael Hughes, Director of Strategy and Partner, Truly Deeply. 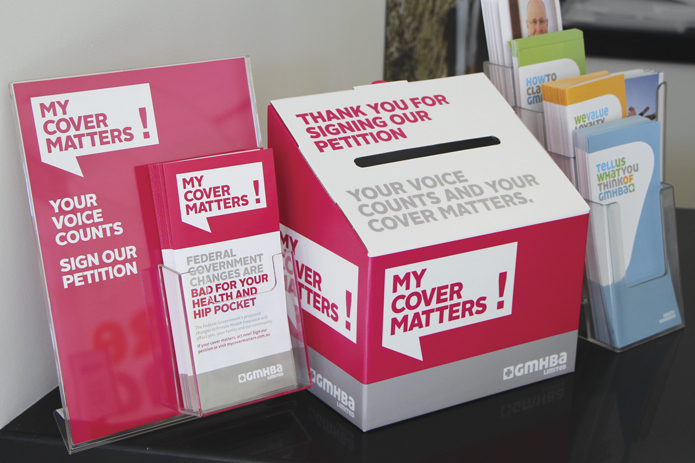 The name ‘My Cover Matters’ is not only a unifying campaign concept, it is a strong call for action that members can take ownership of and use as part of the conversation, particularly in social media. 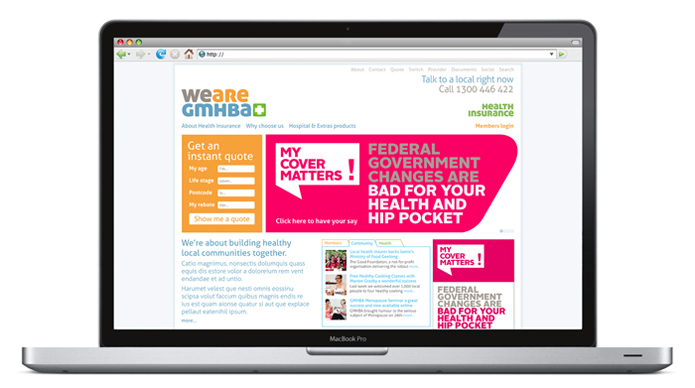 A distinct identity and visual language was designed to distinguish it from GMHBA’s brand and reflect a potent, serious, independent and public interest image. “The brand is inspired by from the language of grassroots public activism and designed to encourage community ownership. It’s a simple and strong identity with powerful and flexible graphics that have been deliberately crafted to ensure it can be applied to any application from in-branch to advertising and social media, says Derek Carroll, Creative Director and Partner, Truly Deeply. Truly Deeply designed the campaign identity, website, information video, social media, flyers, press and radio advertising, member collateral and in store brand communications.